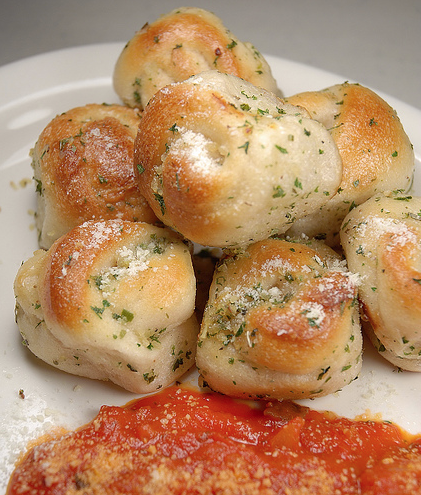 Granted a good batch of garlic knots does not an entire meal make, they sure do augment a hot pizza pie better than anything else, in our humble opinion. And seeing as how Lost is on this evening, and that is reason enough to order a half pepperoni/half sausage, we thought, "To be fair, we'll make the garlic knots." Whether or not this is actually going to happen is yet to be seen, but it's good to know we at least have a recipe for it. Prepare Basic Pizza Dough as recipe instructs below and set aside to rise. Combine butter and garlic in a small saucepan over low heat. Cook until the garlic is fragrant and tender, 3 to 4 minutes. Cover, remove from the heat and set aside. Keep warm. Preheat oven to 375 degrees F and lightly grease 2 large baking sheets. Set aside. Remove risen dough from the bowl and place on a lightly floured surface. Using a lightly floured rolling pin, roll dough out into a large rectangle, about 16 by 12 inches. Brush the dough lightly with the olive oil. Cut the dough in half lengthwise and then cut crosswise into strips about 1 1/4 inches wide. Tie each strip loosely into a knot, stretching gently if necessary, and place on prepared baking sheets about 2-inches apart. Sprinkle the tops of the knots with salt. Cover with plastic wrap or a clean kitchen towel and let rise in a warm, draft-free place for about 30 minutes. Bake until golden brown and risen, about 20 minutes. Transfer to a large mixing bowl and toss gently with the warm garlic butter, Pecorino Romano cheese, and parsley. Add salt to taste if necessary. Serve immediately. In a large bowl, combine the water, yeast, honey, and 1 tablespoon oil, stirring to combine. Let sit until the mixture is foamy, about 5 minutes. Add 1 1/2 cups of the flour and the salt, mixing by hand until it is all incorporated and the mixture is smooth. Continue adding the flour, 1/4 cup at a time, working the dough after each addition, until the dough is smooth but still slightly sticky. You may not need all of the flour. Turn the dough out onto a lightly floured surface and knead until smooth but still slightly tacky, 3 to 5 minutes. Oil a large mixing bowl with remaining olive oil. Place the dough in the bowl, turning to coat with the oil. Cover with plastic wrap and set in a warm place, free from drafts until doubled in size, about 1 1/2 hours.